Keith Page reveals sequel to "London Calling"
Ace artist Keith Page continues to tease his loyal fans with more of his work over on his blog, this time revealing a part scan of the cover for Squadron of the Screaming Damned, the sequel to one of his Charlotte Corday stories London Calling, which will be published by Timebomb Comics. 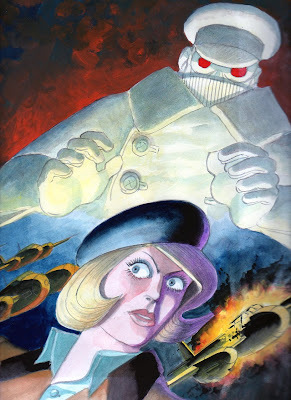 Keith's latest comics work includes an issue of Commando, set in World War 1, and "Hush, Hush", a strip for STRIP Magazine Issue 1 (still on sale in UK comic shops), which is a prequel to his graphic novel The Iron Moon. Hammer Films has launched an official print-on-demand online store today, featuring iconic UK quad artwork from legendary horror titles including The Mummy, One Million Years B.C. and The Devil Rides Out. 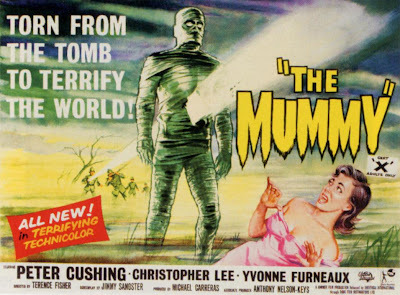 The store features high-quality reproductions of UK quads from the extensive Hammer library including the latest titles Let Me In and Wake Wood, along with newly-restored posters for such beloved horror classics as X The Unknown, The Abominable Snowman and Frankenstein And The Monster From Hell, all of which are reproduced for the first time and exclusively available. Each classic poster featured on the site will be available in two styles; "restored", appearing as new, and "aged", subtly weathered to create a retro aesthetic. Designed by renowned film poster artists Bill Wiggins, Mike Vaughan, Vic Fair and the legendary Tom Chantrell, and curated by Marcus Hearn, Hammer's official historian, the artwork will be available as posters (paper or canvas; framed or unframed), prints, greeting cards and postcards. Additionally, to coincide with the release of Marcus Hearn’s new official book The Hammer Vault which hits stores on 2nd December 2011, Hammer is releasing online exclusive content from The Woman in Black at www.hammerfilms.com at Noon on the same day. The Hammer Vault, published by Titan Books, features double-page spreads of classic Hammer titles in addition to recent releases Wake Wood, Let Me In and The Resident. Hammer will publish online exclusive content from The Woman in Black in the “Hammer Vault” style, as part of a three-way promotional tie in for the Hammer website, the book launch and the upcoming film release. The exclusive “Hammer Vault” content, available via a password gate only to those who buy or browse “The Hammer Vault”, will feature interviews with director James Watkins and production designer Kave Quinn, along with exclusive stills, storyboards and photography of production assets and props. The Woman in Black will be released theatrically in the US on 3rd February 2012 through CBS Films and in the UK on 10th February through Momentum Pictures. The official Merlin magazine - launched in September but a victim of publisher Attic Brand Media going into administration last month - will make a return at some point. That's the official line from a representative of the 22-year-old company, the customer and consumer magazine publisher behind Kick, National Geographic Kids and Kraze Club, one of the UK’s most popular children’s general interest magazines. Media Week reported that ABM went into administration in mid-November, with the loss of at least 17 jobs. According to their sources, four ABM titles – Merlin, Kick, Kick Extra and Kraze Club - were to close but National Geographic Kids would continue to be published under a new company. We now understand that Merlin, too, will continue to be published but no relaunch date has been announced and the publisher has not been named. "Unfortunately Attic Brand Media has gone into administration and will no longer be publishing magazines," the company's former Marketing & Promotions Manager Peter Johnson, who is still working on National Geographic Kids, told downthetubes.net. "I do believe someone else will be publishing the second issue of Merlin however I'm not entirely sure who - or when it will go on-sale." 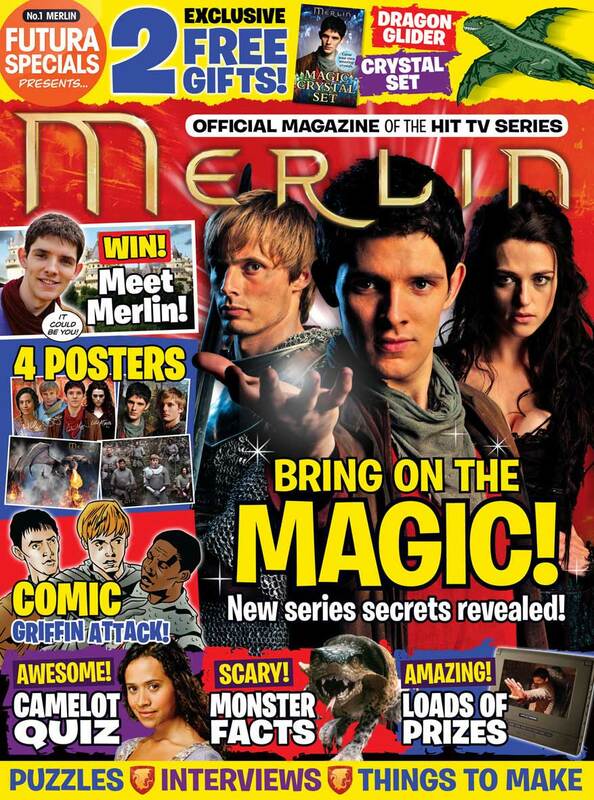 As we previously reported, Merlin, which closely emulated the format of the BBC's Doctor Who Adevntures but was planned as a monthly rather than weekly title, launched in Septmber and included an orignated comic strip comic strip written by Damian Kelleher and drawn by Lee Carey. Retailing at £3.20, Attic were offering worldwide subscriptions for the title, the first magazine of the company's planned Futura Specials series, a range which also includes the football-themed posters and puzzles magazine, KiCK! Extra, and the games and entertainment title, Kraze Club. 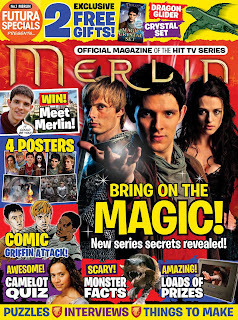 The first issue also featured exclusive cast interviews, souvenir posters and prizes - including a once-in-a-lifetime opportunity to meet Merlin actor, Colin Morgan. (We're told the competition will be honoured and the winner informed direct by the Merlin TV show production company, Freemantle Media). "It will be a magical treat for boys and girls aged seven to 14 (and a guilty pleasure for all those Merlin fans who are that little bit older! )," the PR proclaimed. Launched in 2008, the Merlin TV series tells the story of young Merlin in Camelot, as he comes to grips with his powers and destiny. Merlin's success and popularity continues to flourish across the globe . Several publishers previously pitched for a license for the Magazine, and samples designs and strips materials were created by Interzone illustrator Smuzz for one dummy. In addition to Merlin, Attic Brand Media previously launched some of the UK's most popular teen, kids and TV magazines, including TV Hits, B, All About Soap, Sugar, the UK's first "baby glossy" for teenage girls, and Inside Soap, the UK's first dedicated soap title. PJ Holden - artist on Strip Magazine's Black Ops Extreme - will be doing a signing at Forbidden Planet International Belfast (facebook link) this coming Saturday 3rd December between 1.00 and 3.00pm. 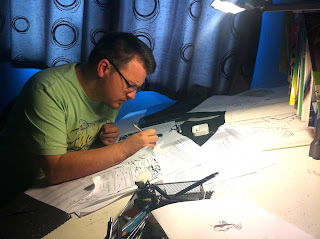 In addition to Black Ops Extreme, PJ's credits include 2000AD, Image Comics, Dynamite Entertainment, Games Workshop and Egmont UK. He's also working on Dept. of Monsterology (written by Gordon Rennie), which will be published by Renegade Entertainment next year. Copies of STRIP Magazine Issue 1 - featuring a cover by PJ - will be on sale.